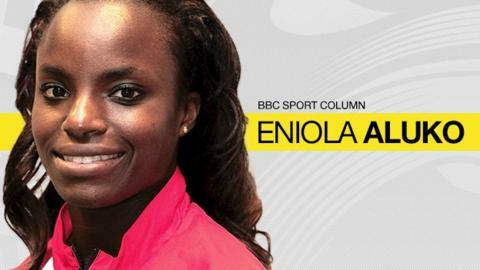 England and Chelsea forward Eniola Aluko will be writing a regular column for the BBC Sport website throughout the World Cup. The tournament approaches kick-off on 6 June, and as part of Women's Sport Week she explains here why she thinks it could be as big as the men's World Cup and asks how it could have an impact on the growing status of female players. That tournament was in China, so the crowds were big, and I think there were 27,000 at that game in Shanghai, but the 2015 World Cup promises to be on another scale. For the first time there will be 24 teams and a second round knockout stage with 52 matches in all. So I think this will be the first World Cup where people all over the globe will know it is taking place. With TV audiences expected to eclipse the 400m people that tuned in four years ago and nearly one million tickets already sold, I think it will be on a par with the men's tournament and it just shows you how the game has grown from a commercial perspective. Players in the United States team can already command an income of up to $2m a year through endorsements, and the pre-tournament promotion from the established nations is bigger than it has ever been. Who knows what the players can earn after this World Cup? Success is the precursor to everything in football. Before the last World Cup or Olympics, no-one really knew who US striker Alex Morgan was. Now she can earn huge sums because her profile went global after helping her team reach the 2011 final and win the London 2012 Olympics. That's how it should be. In England the women's game is growing, the Women's Super League has established itself as a semi-professional format since 2011 and the salaries are improving up to about £60,000 a year. In that commercial sense, there are still areas to improve on but only winning can help that and hopefully we can be at the World Cup final on 5 July. With increased media coverage and a huge north American audience, the tournament is a great opportunity for more people to fall in love with the women's game. There will be eight teams making their World Cup debuts in Canada and we are bound to get games where one team thrashes another but we can't be embarrassed of that. Look at what happened in the men's semi-final last year where Germany trounced hosts Brazil 7-1. The important thing is that the tournament creates new fans all over the world. Nigeria have played in each of the previous six World Cups and I know that people get behind the team even if there isn't a proper domestic league over there. I don't think it's a coincidence that the under-20 team reached the final of their World Cup last year. We have been in Canada for more than a week now and while Toronto has not exactly caught World Cup fever as yet, we've spent some great time sight-seeing at Niagara Falls and watching the Toronto Blue Jays baseball team. Toronto is not one of the six World Cup host cities, so while walking around a lot of people have been asking what we are doing here. Therefore, I'm quite excited to get to the venue of our first match against France - Moncton - and sample the World Cup vibe properly. We got a taste of that in our friendly match against the hosts Canada last Friday where more than 23,000 turned up to watch them beat us 1-0 in Hamilton. The result was disappointing and based on the fact that we are used to scoring, it wasn't our most fluent performance. We found it difficult to create chances but we will take lessons out of it when the tournament begins for real. We can't use the artificial surface as an excuse. It does take time to get used to the bounce, but it was the same for both teams and I think we are becoming accustomed to the surfaces here. France knocked us out of the 2011 World Cup and the 2013 European Championship, so it's fair to say there is a bit of history between us. I don't think we have beaten them in 40 years so they will have a certain psychological edge over us. But that doesn't mean we can't beat them and given it will be the toughest game of the group, because of their superior ranking, it might be a good time to play them. Since we last played them in a major tournament, we have a different manager - Mark Sampson - and different players. We have a coach who wants to play in a different way and wants to go into the tournament psychologically believing we can win. I don't think we have been brave enough to say that in the past and I think it gives us an edge - to say that we want to be in it until the end. The United States and Germany don't say maybe we will get out of the group. They say they want to win it from the start and I think that's a major difference. I'm reading a book at the minute which my brother Sone recommended to me called 'The 7 habits of highly effective people' by Stephen R Covey. One of the chapters is about beginning with the end in mind. As the World Cup kicks off on Saturday, there is a strong image forming. Who is in England's World Cup squad? Read more on Women's World Cup: Who is in England's squad for Canada?